The second perspective, which would be much more complex than the first, involves the shaping of algorithms that could computationally define RTS operational processes, including that of the abductive-like Relational thinking style. In addition to the possibility of contributing to the development of an abductive inference engine, this second approach could potentially provide a means for enhancing various game theories. Because these styles are non-verbal operational processes that can be observed and codified, the style patterns themselves are capable of being computationally modeled. Although individual style patterns may be iterative, the consequences of their operation will play out differently depending upon contextual variables. Thus, regardless of the purposes for which these style patterns are ultimately applied, the performance of these styles are affected by many factors; even relatively minor changes to a system can alter the whole system. Thus, researchers and developers might be best served by taking an open-systems approach when modeling these styles against each other and against other factors. Unlike closed systems such as motors, these inferencing styles are affected by external factors, as are other open systems like weather and ecological conditions (Ford, 2000, p. 118). Descriptions of some potential computational applications follow. 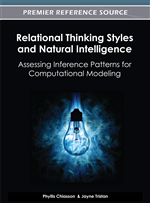 Decision support tools: In addition to the variables discussed in the previous chapter—the thinking style pattern itself, the performance context within which that style might operate, and temperamental issues that may be relevant in some (but not all1) situations—myriad other factors, both internal and external, might influence the performance of these thinking style patterns.